Washington (CNN) - Nearly six in ten Americans give President Barack Obama a thumbs-down on how he is handling the Veterans Affairs controversy, according to a new national poll. But a CNN/ORC International survey released Tuesday indicates that the scandal at VA hospitals doesn't seem to be affecting the President's overall approval rating, which remains at 43%, identical to the last CNN poll conducted a month ago. The survey also indicates that Obama scores some of his highest numbers on the environment and terrorism, two other issues in the spotlight this week. According to the poll, 58% say they disapprove of how the President's handling the VA scandal, with 37% saying they approve of Obama's actions. The Veterans Affairs controversy has mushroomed since CNN first reported last November on allegations of alarming shortcomings within the VA medical care system that potentially have had deadly consequences in dozens of cases. The most disturbing and striking problems emerged in Arizona last month, with sources revealing to CNN details of a secret waiting list for treatment. According to the sources, at least 40 veterans died while waiting for care at the Phoenix, Arizona, VA medical center. Republican calls for VA Secretary Eric Shinseki to resign grew over the past month, and after the release last week of a damaging preliminary report from the VA's inspector general's office, a bunch of congressional Democrats also said it was time for Shinseki to step down. On Friday, the President announced that the secretary had handed in his resignation. Nearly seven in ten agreed with Shinseki's move to resign, with 22% saying the embattled secretary shouldn't have stepped down. And nearly half questioned said the scandal made them angry, with another fifth saying it made them upset. Obama's overall approval rating stands at 43%, with 55% saying they disapprove of the job he is doing in the White House. "Obama's approval rating has not budged since March, when it hit 43%. That's par for the course for the President, whose job approval numbers have been stuck in the mid-to-low 40s for nearly a year," said CNN Polling Director Keating Holland. "The President doesn't get a majority approving of his track record on any of the 12 issues tested in our poll, but his highest scores come on terrorism and environmental policy, with 49% approving of how he is handling both of those issues," Holland added. It should be noted that most interviews in the poll were conducted before any news broke of the controversial transfer of five terror prisoners from the U.S. base in Guantanamo Bay, Cuba in exchange for the release of Sgt. Bowe Bergdahl, who was held captive in Afghanistan by the Taliban for five years. And the survey was conducted mostly before news of Monday's announcement by the Environmental Protection Agency to dramatically limit carbon pollution. "Given the administration's emphasis on environmental policy this week, it's worth noting that the number of Americans who say that the environment is the top issue has quadrupled since last year," added Holland. "But only 8% today name the environment as their top concern." That puts the issue a distant fourth behind economic matters (40%), health care (19%), and the deficit (15%). According to the poll, more than six in ten disapprove of how the President's handling those three issues. The poll was conducted for CNN by ORC International from May 29 to June 1, with 1,003 adults nationwide questioned by telephone. The survey's overall sampling error is plus or minus three percentage points. That means 44% of Americans are for taking more money from those who work and giving it to those who don't. The 56% (who work) better wake up and get these socialists out of office. 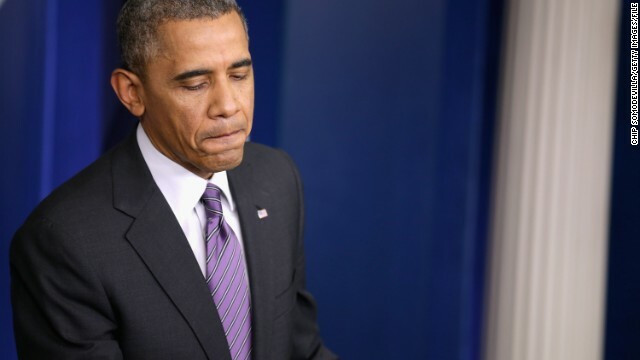 43% of Americans actually approve of Obama's job performance? We have that many sheep? Obama is a dud and extremely disappointing as a leader. I don't regret voting for him but he is a failure based on his performance in office. @SniffinPoopSki: Sniffit really gets under your (and other folks lacking in imagination) skin, what with all his facts and spot-on analysis. Very telling that all you can come up with is lame attempts at pithy wordplay. Guess that's the best you can do when your candidates are certifiable loonies and all your policies are proven failures. Congress is comprised of two chambers – the house which is controlled by the repubs and the senate which is controlled by the dems. Are you trying to mislead people to believe that those horrendous poll numbers are only attributed to the repubs? Because you are also the same person that says that nobody cares about Benghazi yet polling shows a dramatically different story with almost 6 in 10 independents disagreeing with your theory. @cjb: Reagan traded arms to Iran in exchange for hostages. How do you feel about that? When you think about 43% in the general sense while low it's not 'that' bad when you take into consideration he's polling at robust 95% with blacks then 43% is embarrassingly low. Another day another epic failure from THE BIGGEST LIAR OF THE YEAR. "He just released 5 Osama Bin Laden's back to their country so they can attack and kill us again and again. LOL! You guys and your hysterical hyperbole....too hilarious. Next up: 'He armed them and gave them the football!!!!" Al Qaida is on the list of terrorist groups, yet the Taliban is not. It appears that the brain dead followers of Fox did not get the memo. No one negotiated with terrorists. I am also getting tired of RWNJs trying and convicting soldiers on Fox News. Of course, at this point is HIS presidency, GWB had an approval rating at LEAST 10 points lower. Of course, at this point in HIS presidency, GWB had an approval rating AT LEAST 10 points lower. "BWAHAHAHAHA!!! A lefty now using Rasmussen polls??? Desperation is setting in for sure. " Rasmussen: well known for having a conservative lean to their polling and using push-polls to get results favorable to conservatives. Rasmussen poll: more positive results for Obama than the poll CNN is citing. Positive results from polling outfit biased AGAINST Obama = evidence that things probably aren't quite so bad as the other poll makes it seem. Any questions or do you need someone to help you read that because it wasn't written in crayon on a Denny's placemat? It's frankly amazing given the numerous scandals, inability to get things done and outright incompetence. What's the alternative? Republicans? The party that wants our POW's to be tortured? Funny – they whine all about the guy in Benghazi (who they condemned to death by refusing to pay for security), but the GOP turns around and says we should've let the POW die in captivity? Truly a lost and destroyed party, trying to grab onto the melting ice bergs. Frankly it is surprising that it's that high given all of this administration's missteps. And now add the latest prisoner swap fiasco. Five terrorists for one soldier with questionable circumstance behind his "capture". Amateur hour.